I have to admit that I have never made Monkey Bread before. My brother’s used to make it when they were younger, but I’d already left the house for college. My husband has even made it for my boys, but always when I am out of town, a father/son tradition. In both cases it was made with a dough or biscuits that come in a pop-open-tube from the grocery store. You know just what I am talking about. This is perhaps why my husband only made them when I wasn’t around. Trust me, I love anything made with cinnamon sugar and caramel, so the concept appeals to me. When I found myself with a bucket of brioche and wanting to make the boys a treat, I thought Monkey Bread. Now I wonder how come it took me so long to figure this out? It is simple, fun and absolutely delicious. Only make them when you have people to share them with, or you will find yourself nibbling at them all day like I did. Luckily, my boys and their friends came home and saved me from eating the entire pan. Sprinkle the surface of your dough with flour and take out a 1 1/2 pound (large grapefruit size) piece. Roll the dough into a log, about 2-inches in diameter. Cut the log into about 8 slices and then cut the slices into quarters. Roll the dough into small balls. 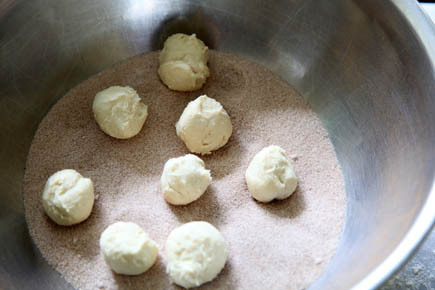 If the dough is sticking to your hands, coat your palms with a small amount of soft butter. Combine the sugar and cinnamon in a large bowl. 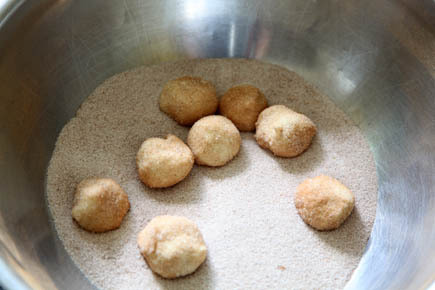 Drop the dough balls into the bowl and coat them with the cinnamon sugar. Place the balls in the prepared loaf pan. Allow the dough to rise for about 1 hour. Just before putting the loaf pan in the oven melt the butter, brown sugar and salt in a small saucepot, stirring until completely smooth. Pour over the dough balls. Allow the bread to cool slightly. Turn the loaf our onto a serving tray. I thought of making the leftovers into bread pudding, but there were no left overs. I suggest you make two and use one in our bread pudding recipe. Enjoy! This recipe might excite me more than anything else you’ve posted here. I seriously think the photos have raised my heart rate. (And my cholesterol!) Mmmmm. Is there any of the gluten free doughs that you have done this with? I would love to try it gluten free! You can make this with the gluten free brioche dough from HBin5, but it will be much different to work with. I would just scoop the dough up and toss it in the cinnamon sugar, don’t bother trying to get it in round balls. Have been trying to forget my monkey bread craving from last year and had just succeeded. Now I will have to make this. And eat it allll!!!! any ideas on how to incorporate some raisins into this? perhaps in btwn the layers of dough balls? looks delish! You could sprinkle the raisins between the balls of dough. It will be very tasty. I was thinking to do the same thing with pecans, but I have one son who refuses to eat nuts these days. 🙁 Once he is over this phase I will try the recipe with the nuts! Mmm.. I love monkey bread. The best ever, though, was with your Pumpkin Pie Brioche dough. Seriously amazing. I was thinking of making it with the pumpkin brioche like Kelly, plus the cardamom sugar from the doughnut recipe from HBin5. Now I’m looking forward to hosting a breakfast once our pumpkins are ready! Thanks Zoe. Yuumo! I will try it this weekend! I am making bread at home ever since I got ABin5….its easy and I can add whatever I want in flavor! I make pizza, naans, bread, burger buns out of my own customized recipe! Its mix of whole wheat, all-purpose, olive oil, vital wheat gluten…..and I use it for all of the above. Turns out great! My only complaint is slicing….I wish I could go to one of the bakeries and have it sliced…. 🙂 Any ideas as to slice bestest? Btway, I wish for more savory bread recipes! like a different stuffing or different toppings or even a novel sandwich! There are several more savory breads in the second book Healthy Bread in Five Minutes a Day. Having a very sharp serrated knife makes all the difference. You also need to be sure that the bread is fully cooled off before slicing it. Wow, looks absolutely delicious! Looking forward to making more breads now that I have HBin5 to keep my ABin5 company. Today I tried epi for the first time, using the 100% whole wheat with olive oil recipe, and dusting with kosher salt and sesame seeds just before baking. It came out great and was just as easy as you say! I used some more of the same dough to make the Grissini (bread sticks), and I have to keep chasing my husband away from them (they are for company tonight). Thanks so much for all the help you give us! The epi is one of our favorites and we make it with every dough possible! Hi! 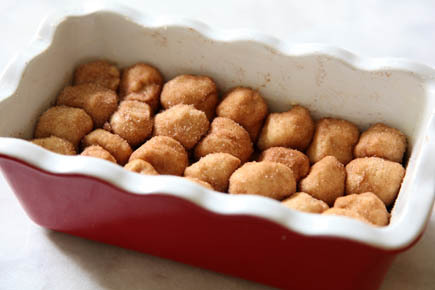 I am making Monkey Bread right now! The Brioche dough is rising and I have made the mistake of telling a few others what I’m doing and so likely I’ll have to share. Smile. I do have just a question, though… In your recipe you say to roll the dough into a log, cut it into 8 pieces and each of those into 4 pieces. That’s 32 pieces. But your pictures show almost twice that amount of balls in the loaf. Did you do a double recipe in your picture, or was it still one and a half pounds of dough rolled into two logs instead of one? Just want to make sure mine turns out the same as your scrumptious pics. Thanks! I used the same amount of dough, but I wasn’t that careful about the size of the balls. You can make them a bit larger or smaller and still have it come out as delicious! The recipe above has 1/4 teaspoon of salt in the ingredients list, but I don’t see where it’s used elsewhere in the recipe. Anyway, I’m trying it now without the salt. The salt is meant to go in the butter and brown sugar mixture. This will be a perfect hurricane watch snack! What an awesome recipe!!! Yum! I followed your recipe but with the following modifications: I used 2 lbs of dough (didn’t have any on hand and it’s easier to do the math) and used a bundt cake pan. I rolled the pieces in butter first because it held onto a lot more cinnamon sugar. But then the same amount of caramel syrup. It started to burn on top so put tinfoil on it. The caramel syrup was a very nice touch. Because of using so much more cinnamon sugar due to dipping in butter, there was much more syrup on ours than in your pictures when we turned it out of the pan – more similar to the sticky pecan caramel rolls (which I make often!). This was NOT a problem! We’re having a hard time determining if we like these better, or the caramel rolls!!! Thanks again! I am addicted to your bread. thanks for the variation, jennifer! Looks delicious! Any suggestions for how to speed things up or do some advance prep work to make this a yummy (and faster) breakfast for hungry morning tummies? You can set this whole loaf up in the pan the night before, cover with plastic and allow it to rest overnight. 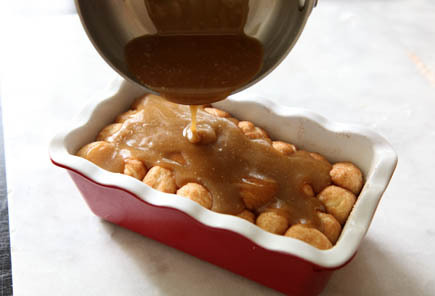 The next morning, put the pan on the counter as you preheat the oven, make the caramel, pour the caramel over the dough and bake. The rolls will rise slowly overnight and have the same result as resting on the counter for an hour. Loving the books, and every recipe has turned out great so far! I’m having this same question about the monkey bread and your other “morning breads” like the cinnamon swirl. Can you please be more specific about how to prep the night before and bake in the morning? In your response above, it wasn’t clear whether you let it rest overnight in the fridge, or on the counter? If in the fridge, how much it time does it need in the morning to warm up, before baking? Yes, you could use any of the enriched doughs for this recipe and it will be delicious! would only the enriched dough be good or the lean dough too? It will work, but the bread will be less sweet and will have a slightly different texture. Hello, What texture would you guess? More chewy? Not as soft? ‘Cause I tried donuts with lean dough and I enjoyed them but they were chewier than a traditional donut and they never browned. yes, they will be chewier and less soft than the breads made with enriched doughs. but, still tasty! 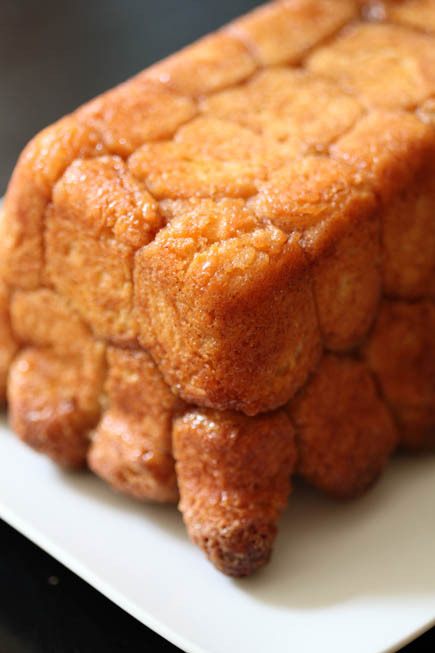 I have been looking for a recipe like monkey bread and this is just amazing. I love caramel and bread dipped in caramel is making my mouth water. I am excited to try out this recipe. Looks pretty easy. Thanks! I made Pesto and Pine Nut bread from HBin5 for the first time today while hunkered down for Irene. Wow! Another winner! Keep ’em coming! I use King Arthur white whole wheat and bread flour when I make whole grain bread. I also use their whole grain dough enhancer. Could I sub these in your basic ww boule/oblong loaf? I also have their AP, of course. Mary Ann: If you swap bread flour where all-purpose was called for, you might need to increase the water a little. Unless the KAF dough enhancer is a water-absorber, in which case all bets are of. We haven’t used dough enhancers, so not sure how to advise. My guess is that it’s worth trying, their products work nicely in our recipes. Still ♥ ing your bread!. In fact, just this a.m. I was listening to a radio station and they put out a contest asking “what’s your favorite ‘go-to’ meal?” – I of course, said I did not have a specific MEAL, but that I could make a 1000 variations on my favorite recipe – your artisan bread. Believe it or not, the radio announcers had NEVER heard of your recipe, so I’ve supplied your blog site and you tube vids and mentioned your book. I hope it opens doors for even more people to know about your fabulous recipes. Thank you so much, your recipe has become a huge presence in my life, I’ve taught so many people, made new friends, gotten to know my neighbors and also had great fun. Barb – your hugest fan! I spoke to Jim and Lynette the hosts – I BET if you gave them a call sometime they would LOVE that!!! They love to share GREAT ideas. Just tell them I referred you. By the way, I have a dear friend who is Italian, she used to have pizzarias – thats how she put her kids through school, well I showed her how to make your recipe and SHE now makes buckets and BUCKETS of your dough! We were invited to dinner last night and she made SEVEN pizzas – and baked them on the bbq. She actually places a couple of bricks on the grill and then bakes them – heavenly. Be still, my heart! Yum!! 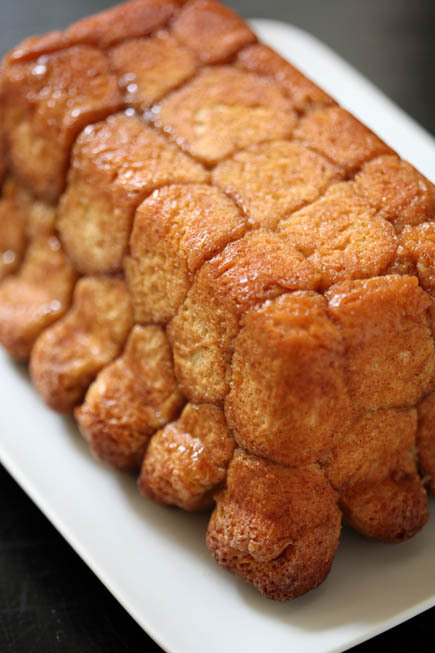 Monkey bread looks awesome! About a month ago, on a whim, I used the brioche dough instead of those pop biscuits to make Gorilla Bread (saw it on Paula Deen cooking show). It’s the same as Monkey Bread except that you put a cube of cream cheese and a bit of the cinnamon sugar inside a dough ball. I’ve done it with some mini chocolate chips inside too. Maybe that was too crazy. That is so over-the-top! I have to give it a try! I need some help. Want to make the traditional long nut rolls and apricots rolls for the holidays.. What version of bread dough would I use.? I am not sure if reg traditional would be too crusty for a sweet dessert ????? I would use the brioche dough for this, or the challah if you want it slightly less rich! Would this work with the original dough (I am wondering if the brioche might be too sweet for my family’s taste)? Or would that need to be baked at too high a temp for the glaze? I froze for 2 weeks ABin5 Challah and thawed out overnight in fridge and then made a braid and it is not rising hardly at all……..help please have 6 more 1 pound in the fridge. Sometimes it is just a matter of letting defrosted dough rest for a bit longer before baking. Sometimes the yeast doesn’t have quite as much rising power after being frozen, so it just needs a little more time. Try letting it rest for an extra 20 to 30 minutes. Forgot to add that when I made a loaf before I froze the rest it was wonderful. Hello, I’m going to try to convert my grandmother’s bread recipe to your method. I’ve read up on hydration and made lots of recipes from your books, so I’ll just start experimenting! Her recipe calls for both molasses and white sugar. (small amounts of each, it is not a sweet bread). I’ve noticed that none of your recipes call for sugar except for 1 T. in the olive oil recipe. Is this personal preference or is there something about your unique method that doesn’t work with sugar? Michelle: In our two books (http://bit.ly/cNtfJI and http://bit.ly/3wYSSN) there are plenty of sweetened doughs, though we both love the taste of honey. Sugar or honey, or natural sweeteners all work well too. Another ingredient in her bread is “Red River Cereal” which adds interesting texture. It is a Canadian product, made with rye, flax and cracked wheat. I think it is generally available in Minnesota. Have you ever worked with it? Might be fun to try. It is available mail order. Thanks for all your work and answering these blog questions. I’ve never been a bread baker until these books came along! Your fantastic books have made bread baking a piece of cake – actually MUCH easier, and oh, SO much FUN! I’ve been making bread for years, and many being special family recipes. I’m wanting to convert as many as I can to your 5-minutes-a-day way, but have a question or two. Most of your recipes call for water as the liquid. Okay to use dairy like 1/2 and 1/2 instead? How do I convert my liquids vs dry ingredients to achieve the slacker dough? Any other suggestions you can offer, I would be enormously grateful! I began using your method with my sourdough (LOVE it!) – moved on to baking stone – and now to the cloche . . . Then I tried the Brioche! Oh, my! All the YUMMY goodies you can make with Brioche! I’m hooked! Thank you both SO much for this wildly delightful adventure! Jeff — made these with left over olive oil dough (we have family pizza night every thursday and I have a bit more than a pound of dough left) and they were awesome! I also made some with the challah dough, and they really didn’t taste a lot different! I think what it means is that in the future I just may stick to the leaner dough for this and keep the calories/carbs down a wee bit. Thanks both of you, for posting a very yummy and fast recipe! Made pizza crust last night with the Soft Whole Wheat Sandwich Bread, now I am using it for the Monkey Bread. I can hardly wait for it’s deliciousness. It was so easy to make. My name is Sabrina, Minnesota Grown, Wife, Mother, Domestic Diva, and Nurse. I fell in love with Artisan Bread in Five minutes a day a few years ago when both of you were on a Minnesota talk show demonstrating your bread making techniques. I am contacting you as I have a great idea for another book that will bridge the love of bread and cooking meals for a family. I would appreciate the opportunity to discuss my ideas, recipes, and partnership on another Artisan Bread in Five Minutes a Day recipe book. Artisan Bread in Five Minutes a Day….1 Bucket, 2 Meals….. Thank you for the lovely note. Jeff and I are working on a number of projects right now, too many, but so appreciate your enthusiasm for the bread and the books! I just made this with the Boule dough. It was amazing! I was a little worried when the dough didn’t seem to be rising, but in the oven it rose perfectly. I made brioche dough today, and divided the recipe (page 189 in Artisan Bread in Five Minutes a Day). After being refrigerated for 3.5 hours, it’s still very liquidy. I think I mistakenly put 1 1/2 cups water instead of 3/4 cup. I don’t want to lose this dough! What do you suggest? 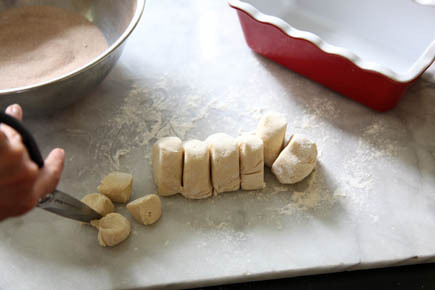 You can work in extra flour until it’s the right consistency (see our videos above). Let it sit on the counter after doing that to re-ferment the new flour. You’ll need to add in as much flour as you’ve already added, should probably do the same with salt and other ingredients, assuming you doubled the water. No need to double the yeast at this point. Just took my monkey bread out of the oven and it is gorgeous. We added a little butter and wolfed down the first pieces. My husband would be content with the rest of the recipe for dinner tonight, but I insisted on some veggies. But I’m sure this will make a great breakfast tomorrow. My Amazon.com store card got a run for its money as I discovered your book and bought up a ton of supplies. Included in the many boxes from Amazon was compressed active dry yeast (the 2 lb package). What is the conversion from this type of yeast to packets? I made the master recipe last night, and it was fantastic. Trying brioche and monkey bread on Thursday. Thank you for saving me the expense of a bread machine! Andrea: the 2-lb package measures the same as what’s in the jars. One packet is about a tablespoon (actually 2 1/4 teaspoons). Thanks for calling in to the show today! It was fun to hear from you. You can store the yeast for about 6 months, maybe a bit longer even. After six months, test a tablespoon in lukewarm water to make sure the yeast is still going strong. Brioche recipe calls for 1.5 tablespoons of activated yeast (2 packets). If a packet is 2.25 teaspoons, then 2 packets is 4.50 teaspoons. (This is what I made my first dough recipe with, and what is baking now.) However, if I remember my conversions correctly (and this essentially was my question on the phone), 1.5 tablespoons is 6 teaspoons. 4.50 does not equal 6.00. 🙁 Which value provides the correct amount for the recipes — teaspoons or tablespoons? You are good with the amount of yeast you used. In fact you can make the dough with much less yeast per batch, some people only like to use 1 teaspoon. But the less you use, the longer you wait for the initial rise time. The difference you are talking about is so insignificant that you will never see a difference. Yesterday I made the skillet apple pie and today the blush apple tart. I modify them slightly to suit cooking in my Weber BabyQ. They both turned out great especially the tart. Thanks so much for your wonderful books. This is wonderful, so glad to hear you are using the Weber to bake these! I am very excited to try this recipe. Can I use a bundt cake pan instead of a loaf pan? Yes, you can certainly bake it in a bundt pan. I made the brioche two nights ago, and as I mixed it up, I realized I was out of honey. I did have maple syrup, though, the real kind, so I used that. Turns out that’s a really nice substitution. The one thing I thought I might mention is that I had a LOT of cinnamon sugar left over. I probably could have made half the amount and been fine. I saved the leftover cinnamon sugar and will use it for something else. Thanks for the tips, Meagan! Thanks, Jeff and Zöe! I love all the books, and I especially like how the website complements the books and makes them come alive! I was looking for something sweet and cinnamon to bring to a morning gathering at work for today, and came across this recipe idea on the website. I used the American Style pizza dough from the pizza book, and it was fabulous! Soft and sweet – I got tons of compliments, and no left overs! Thanks! As Graham would have probably told you, we have an abundance of maple products here in southern Quebec. Could I sub out, say, half the brown sugar in the sauce with granulated maple sugar? Do you mind if I pose a question for you, based on your more extensive baking experience? Because I’ve been baking monkey bread in the crockpot, using a relatively healthy balance of all purpose and white whole wheat flour in your brioche dough, which works really well. I’ve also been experimenting with several different “sauces” to dip the dough balls in and pour over the top. In my unscientific taste tests at church and at home, the grownups love the Chai Monkey Bread, while the kids love and prefer the Pumpkin Spice Monkey Bread. 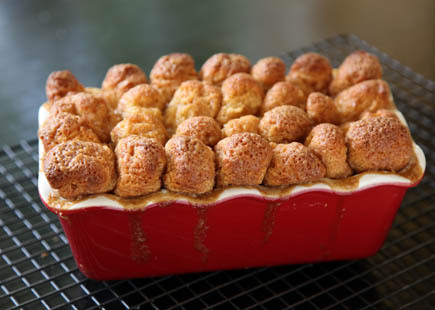 Here’s my challenge: The ingredients I’ve used for my Monkey Bread Sauce creates a sticky but not glossy sauce which is not pretty – unlike the basic butter-sugar-and-cinnamon sauce we all love, but which may not be so good for us, and it’s pretty to look at! By contrast, my Monkey Bread Sauces are kind of unattractive, but still delicious. Since I understand that people “eat with their eyes,” as well as their noses, mouths and tummies, I would like my Monkey Bread Sauce to be prettier! Q. Would you perhaps have any ideas how I might “tweak” the two sauce recipes below to make them glossier and prettier? I’m still at the experimental stage, so any and all ideas and suggestions are welcome! Thank you. Hmm, it’s so specific, I’m afraid I couldn’t comment without doing the experimentation myself. Does anyone have suggestions? I made this today as a “day after snow day” treat with the rest of my light whole wheat bread dough. I added chopped walnuts and raisins and baked it in a half-sized bundt pan. It was delicious and looked pretty too. Love everything I have tried from your recipes. Thanks! Fantastic, thanks for the kind words.